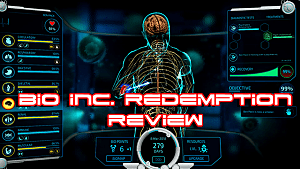 Developed and self published by DryGin Studios, Bio Inc. Redemption is an early access strategy simulation game revolving around the human body and various diseases. The game offers two separate modes of play known as “Life and “Death”. First up we have the “Death” mode, in which you as the player can choose to torment your victims by creating and manifesting different diseases to kill your victim. The game has a percentage bar that indicates how well they're doing. From there you'll collect “Bio Points” by clicking on various spores in different systems within the body. You navigate these systems on the left side of the screen by clicking between them. Once you've gained enough Bio Points you can open up your “Bio Map” and then invest these points in various diseases, horrible life styles, various things known as “Risk Factors”, and methods of screwing with the AI doctors trying to stop you. For example, you can put the doctors on strike, give your victim bad doctors in general, or invest in horrible eating habits to make your victim obese. Once you start infecting your victim with different diseases and multiple risk factors, the various systems within your victim's body will start to slowly weaken before finally shutting down. While this is going on, the doctors will try to stop you by diagnosing different symptoms and treating different diseases you've infected them with, which in turn will block off specific areas on the Bio Map. This leaves you to decide what diseases and parts of the Bio Map you want to unlock. Some diseases also depend on different risk factors such as being over 60 years old or specific heredity conditions--all of which you can unlock with Bio Points you've earned. Once your victim's overall health drops down to 0%, they'll die and you've essentially won. However if the treatment bar on the right hand side reaches 100% -- you've lost. 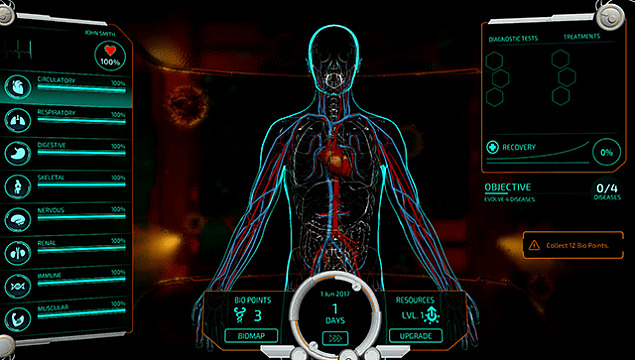 In the “Life” mode, you play as the doctor attempting to stop the AI from killing your patient with numerous diseases and risk factors. In order to do this you'll first begin collecting Bio Points once again by clicking the screen in various different systems. Instead of selecting various diseases and risk factors, you'll instead try to diagnose various symptoms and pin-point what disease your patient potentially has so you can treat it. You'll also want to select healthier lifestyle choices like lifting weights, yoga, proper hydration, and so on. Once you've hit 100% on the treatment bar on the right hand side, your patient is considered “saved” from the AI -- and you've won. What I do know for sure is that killing someone with morbid obesity and constipation never got old for me. I just found it more enjoyable to experiment with different diseases and methods of killing people than curing them and figuring out which disease is behind the different symptoms. “Death” mode overall I found to be a bit more diverse in terms of strategies, thus in-turn more fun. Easily my favourite thing about Bio Inc. Redemption was reading all the different descriptions of the various symptoms, diseases, and life styles. I had very little knowledge on diseases and the game features plenty of detailed descriptions on them. I found myself spending countless minutes simply reading, which is great. All Substance, Yet No Flash? The game is in early access, so pretty much everything discussed here is subject to change, but my biggest issue so far with Bio Inc. Redemption is the lack of presentation. From the moment you start up the game, you're greeted with a corny but entertaining intro video of a crazed doctor talking about experimenting on another victim and another doctor attempting to save lives. The gameplay itself though is pretty much devoid of any theatrics like vocals or audio because pretty much everything in the game revolves around text (outside of the few animations you'll get from unlocking different risk factors and life style choices). Bio Inc. Redemption would really benefit from having a better soundtrack, voice acting, and more visual depth in general as different diseases progress and get worse for your victim or patient. The various game modes you'll unlock as you progress in either campaign are also a bit lackluster and are more or less very slight alterations to the core game mode. For example, competing against another AI to see who can kill their victim first left me wondering, “why isn't this just an online mode to begin with?" The difficulty levels are a bit artificial. I played a few games on the harder difficulty and they're difficult -- yes. But it honestly just boiled down to the Bio Points being much more quick to disappear and difficult to obtain, as opposed to the AI doctor or the AI diseases and symptoms being more difficult to manage. Bio Inc. Redemption is a great game in short bursts, but it leaves you little reason to come back once you've played it a few times. Which shouldn't surprise anyone considering it was originally a mobile game back in 2014 and still very much feels like one in overall design. However, it's a very smooth experience for an early access game. I had no bugs or crashes during the six hours I spent with the game and there is some depth to be found in the various methods of killing a victim or saving a patient in each campaign. It also may surprise you with the various diseases and symptom descriptions and just how unhealthy an inactive life style can be. 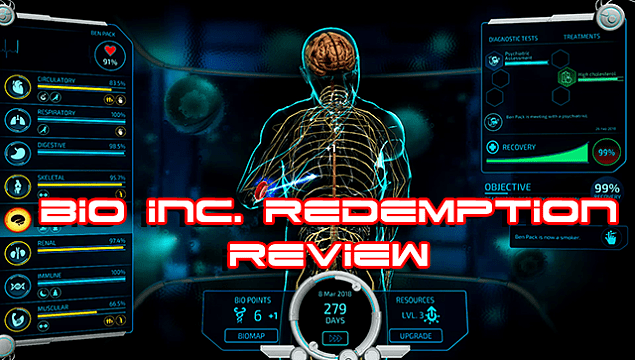 You enjoy strategy games similar to Plague Inc.
Bio Inc. Redemption is available for purchase on Steam now. Note: The developer provided a copy of this game for the purposes of this review. Bio Inc. Redemption is a fun game in short bursts, and has some nice depth, but comes off feeling like another ported mobile game.